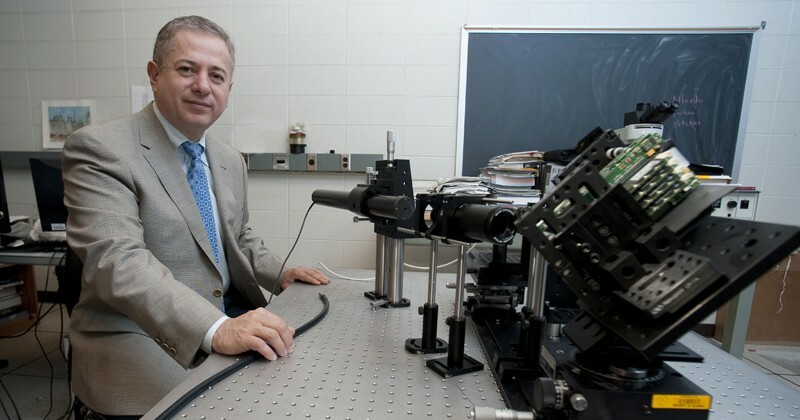 Gonzalo Arce, Charles Black Evans Professor in the University of Delaware’s Department of Electrical and Computer Engineering, has been named a Fellow of SPIE, the International Society for Optics and Photonics. Arce is one of 88 new SPIE Fellows named in 2019. In order to attain this status, members of this society must “become distinguished through outstanding contributions in the relevant technologies, service to the society, and service to the general optics and photonics community,” according to SPIE. 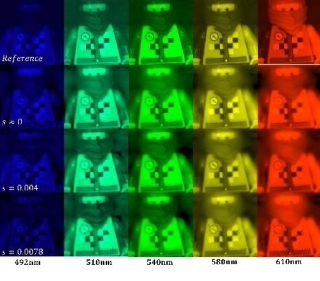 This figure shows a LEGO toy with multiple wavelengths of light captured by Arce’s camera in a snapshot. In a new paper, Arce and his colleagues describe a new computational imaging camera model and its implementation. The LEGOs are used as objects imaged for research. Arce was selected for achievements in computational imaging. His research interests include computational imaging and spectroscopy, signal processing, and the analysis and processing of massive data. Active fields of research include compressive sensing, sparse signal representation, data science, spectroscopy, computational imaging and computational lithography. As principal investigator or co-principal investigator, Arce has been responsible for close to $25 million in research funding from various Department of Defense organizations, the National Science Foundation (NSF), and industry. His latest grant from NSF, which began in 2018, focuses on blue-noise graph sampling, using novel methods to capture interesting phenomena in nature with graphs. He holds 15 patents and has written 154 peer-reviewed articles, five books and 22 book chapters. Arce joined UD in 1982 after earning his master’s and doctoral degrees in electrical engineering at Purdue University. His bachelor’s degree in electrical engineering is from the University of Arkansas. In addition to his post in the Department of Electrical and Computer Engineering, where he served as chair from 1999 to 2009, Arce is a JP Morgan-Chase Faculty Fellow at the Institute of Financial Services Analytics, a Nokia-Fulbright Distinguished Chair in Information and Communications Technologies and an affiliated faculty member at UD’s Data Science Institute. He has supervised 43 doctoral students, who have gone on to faculty positions at institutions such as the University of Kentucky and Texas A&M University and industry roles at firms such as Samsung American and the National Institute of Standards and Technology. Also named an SPIE Fellow in 2019 is Mark Bendett, who earned master’s and doctoral degrees in electrical engineering from the University of Delaware in 1981 and 1985, respectively. Read more about Bendett in this alumni spotlight.